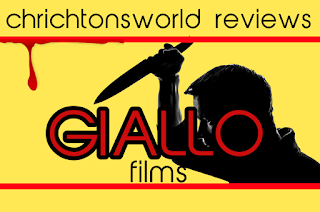 Chrichton's World: Review Demons a.k.a. Dèmoni (1985): Italian horror rules! Review Demons a.k.a. 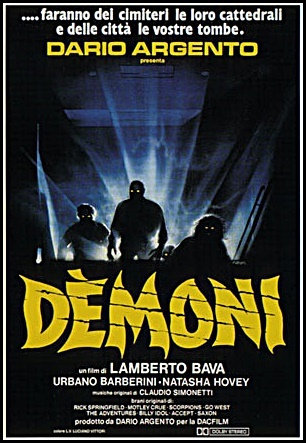 Dèmoni (1985): Italian horror rules! Demons is easily a favourite of mine. It might be heavily flawed and lacking in a strong narrative but it also has many redeeming factors creatively speaking. A bunch of people are handed out free tickets for a film without a title. Nobody is critical of this since most assume it's one of those surprise previews. Little do they know that they are in for a huge surprise but safe to say it's not a pleasant one. For the most part Demons is a low budget affair. However some of the special effects which are practical look quite good. Just proves that all you need is a healthy (or very sick) imagination to do so much with very little. Even when some characters aren't that sympathetic you don't really want something to happen to them. Although it always astonishes me how some people refuse to believe what is right in front of them. Ladies and gentlemen if you happen to see people turning into demons, zombies and other monsters either run like hell or smash them like crazy. Don't ever hesitate. One of these characters played by Bobby Rhodes doesn't hesitate and fights off the demons left and right. Bobby is not very consistent though. One minute he shouts that the people should stick together because then they are less likely to be hurt or killed. Only twenty seconds after he told people to remain together he berates and scolds a guy for getting in his way while the guy came up to him to help out. It's freaking hilarious. But Bobby is a man of action and does what he can to get out the situation unharmed. Unfortunately he can't control the hysterical crowd who in their infinite stupidity assume things they shouldn't and expose themselves to new dangers. Despite the comedic and hilarity that ensues Demons is pretty dark and disturbing. The evil that is lurking is ever present but never truly visible. The humans that get infected or cursed do turn into demons but the force behind it is never shown. The guy who handed out the tickets is nothing but a cog in the wheel. You aren't really given that much background on what is going on. Only what the film played in this hellish theater tells you. That Nostradamus predicted the event that is about to occur. But not why or how it happens. 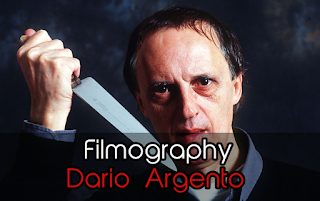 This could have been pure laziness on part of Argento and the other writers. However keeping things abstract and mysterious gives the evil an ominous presence. Demons has quite a few surprises in store for you that might not be entirely scary for some they certainly will be shocking to say the least. Even for veteran horror fans. Definitely a must watch for anyone who loves Italian horror and horror in general.